"What started as a Croque Madame with custard instead of the usual white sauce turned into a Monte Cristo with a poached egg on top. Unable call it a Croque Madame anymore, I turned to Twitter for help. Some dude who goes by the name Zap Shakur suggested I go with Madame Cristo, and the rest is history. 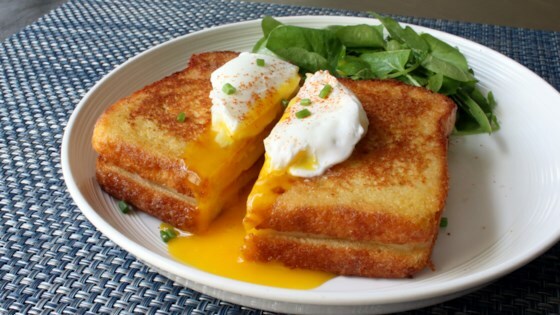 Top with poached or fried eggs and garnish with fresh chives." Toast bread until lightly browned. Add Havarti cheese to each slice. Divide ham between two sandwiches. Bring the two halves of the sandwich together and place into the batter. Flip several times to coat evenly; place on a plate. Repeat with second sandwich. Fill a large saucepan with 2 inches of water and bring to a boil. In the meantime, melt butter in a skillet over medium heat. Cook sandwiches in the hot butter until outside is browned and cheese is melted, about 4 minutes per side. Meanwhile, reduce saucepan heat to medium-low, pour in vinegar, and keep the water at a gentle simmer. Crack an egg into a small bowl, then gently slip it into the simmering water, holding the bowl just above the surface of water. Repeat with second egg. Cook until the egg white is firm and the yolk has thickened but is not hard, 2 1/2 to 3 minutes. Transfer sandwiches to plates and dust with cayenne pepper. Remove the eggs from the water with a slotted spoon, dab on a kitchen towel to remove excess water, and place onto each sandwich. Dust with cayenne pepper. Indulge in Chef John's new, easy-to-make brunch hybrid. If you're just making one or two, feel free to poach your eggs right before the sandwiches are done, but for larger parties, you'll want to check out this recipe, which shows a great make-ahead method for serving multiple poached eggs at the same time. You can substitute milk for the heavy cream, if desired. Use any kind of melting cheese you like, such as Gruyere, Swiss, or Cheddar. I made this without the lemon zest (my husband wouldn’t have eaten it if I had put it in). It was incredibly easy and came out perfect. This will definitely be added to our dinner menu rotation. I also added some hard salami. Oh so good! A fantastic recipe. And a great start to the day.